NBA player Jason Collins recently came out as homosexual. Within 24 hours of his confession there was a coverage explosion on every major media outlet, news station, website, talk show, and yes they were even talking about it at your local barbershop. 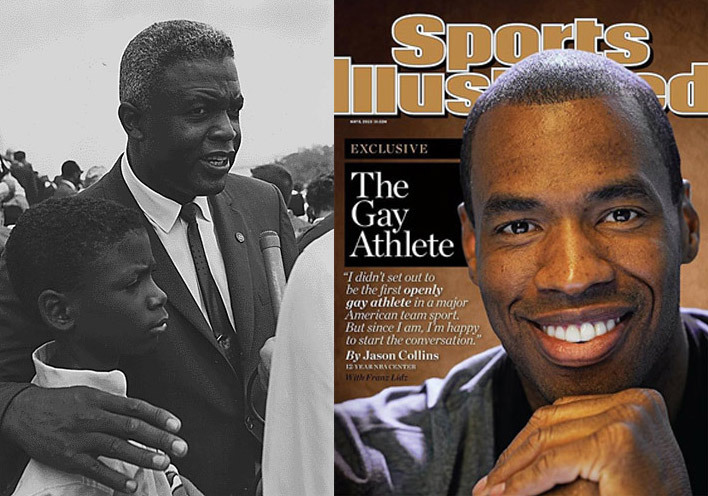 Jason Collins name was everywhere and his face was ubiquitous. Even our President couldn’t refrain from the story, and personally called Jason Collins to congratulate him. It is safe to say that as a result of Collins professing his sexual orientation, he was instantaneously celebrated. But before we give him his coronation, is it fair to call him the second Jackie Robinson? First off, let me be clear that I believe in equality for everyone regardless of their sexual orientation, religious preference, gender, or favorite One Direction member. And honestly I couldn’t be more proud of the acceptance and advancement for the rights of LGBT in recent years. That is what America, this free country, is all about. However what I do have a problem with is the numerous comparisons to Jackie Robinson. I almost feel that it is offensive to Jackie’s legacy to constantly compare him to Collins. So in order to do Robinson’s legacy some justice, I decided to do the comparison myself. Jackie Robinson integrated a sport during a time when segregation was prevalent. If you were “colored” there was absolutely no equality. There were separate water fountains, bathrooms, restaurants, and you “best not” sit in the front of the bus. Lynching’s were an everyday occurrence and racial slurs were used so often you thought nothing of it. In the midst of all this hatred, one man from Cairo, GA had the courage to do something so groundbreaking that the game would forever be changed. Jackie knew what kinds of opposition and adversity he would face, but his tenacity was too strong. He knew that every time he stepped up to the plate there was a high probability he would be dodging a 95 m.p.h. fastball going straight to his face. He knew that opposing teams would saturate hate through name calling, purposely sliding into him, and mentally trying to take him out of his game. He knew that even teammates of his would voice their hatred towards him and objected the idea of showering with him. But through it all Jackie held his composure and played his heart out. Everyday his character was tested, and he responded with the utmost dignity. Now lets look at Jason. First things first, the guy isn’t even on a basketball team. He’s a free agent. But before we look at that, let’s look at the times we currently live in. Homosexuality is at its peak of acceptance, and despite Bill O Reilly followers, the consensus is that this is a nation that embraces it. However I will acknowledge that several decades ago, homosexuals were condemned and even discriminated against. It has been a long path for LBGT and they are still fighting for equality. With that being said, I don’t believe that Jason will ever have to drink from a separate fountain. use a different bathroom, or endure physical harm. To even make a legitimate claim against this, Jason would ACTUALLY HAVE TO PLAY for a team, which he doesn’t. That’s the first major distinction between Jackie and Jason. Second off, there’s no current segregation between homosexuals and heterosexuals. Jason can do anything that his teammates engage in with no repercussions. In addition, NBA athletes have already expressed their acceptance for a gay athlete to join the league. Unlike Jackie, there are no petitions going around to prevent Jason from playing. The league as a whole has embraced Jason. In concluding, I applaud Jason for having the courage to come out in a sport that is driven by masculinity. Regardless of how acceptable it is now, it is still difficult as an athlete to come out the closet. While I commend Jason for revealing himself, I still think his story lacks the heroism that Jackie Robison’s legacy displayed. What Jackie had to endure as an athlete was unprecedented amongst athletes before him and athletes after him. To put it simplistic terms, no athlete will EVER have to experience what Jackie did. And for that reason his name will be forever be synonymous with Hero. Well written & thought out, Kev. You brought up some good points.